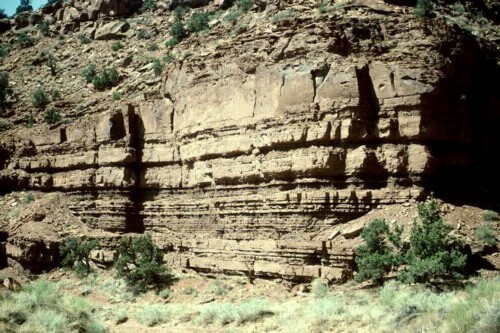 Shown below is a coarsening-upward parasequence developed along a deltaic coastline. Note the flooding surface defined by the abrupt shift from the thick sandstone bed to the overlying mudstone facies near the top of the photograph. This photograph was taken in the Permian Cutler Group of Capitol Reef National Monument in Utah. The trees in the foreground are approximately 1 meter high.